OverDrive | How do I enable dyslexic font? OverDrive offers a dyslexic font option that's designed to make text easier to read for dyslexic users. You can enable or disable this option using the steps below. Under "Display options," select Dyslexic font. Your setting is saved automatically. The dyslexic font option is available for ebooks in the OverDrive app for Android, Fire tablets, Chromebook, iOS, and Windows 8/10. Open a downloaded ebook from your app bookshelf. Tap or click the center of the screen in the ebook reader. Select OpenDyslexic or OpenDyslexic Bold. Tap the center of the screen in the ebook reader. Select OpenDyslexic or OpenDyslexic Bold under "Font style." Select the Settings button at the bottom of the screen. Select the Font drop-down menu. Select Open Dyslexic or Open Dyslexic Bold. Open an ebook in your browser using OverDrive Read. Open the OverDrive Read menu. 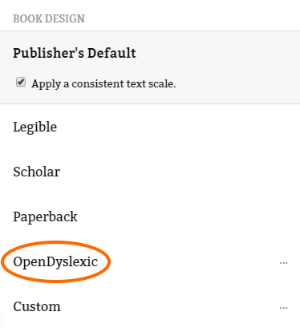 Select OpenDyslexic under "Book Design." Under "Dyslexic Font," choose Off or On. Your setting is saved automatically. Note: At any time, you can enable either the high contrast option or the dyslexic font option (but not both) for your library's OverDrive website.